How do language families evolve over many thousands of years? How stable over time are structural features of languages? Researchers Dan Dediu and Stephen Levinson from the Max Planck Institute for Psycholinguistics in Nijmegen introduced a new method using Bayesian phylogenetic approaches to analyse the evolution of structural features in more than 50 language families. Their paper 'Abstract profiles of structural stability point to universal tendencies, family-specific factors, and ancient connections between languages' was published online on September 20, 2012 in PLoS ONE. Language is one of the best examples of a cultural evolutionary system. How vocabularies evolve has been extensively studied, but researchers know relatively little about the stability of structural properties of language - pholonoly, morphology and syntax. In their PLoS ONE paper, Dan Dediu (MPI's Language and Genetics Department) and Stephen Levinson (director of MPI's Language and Cognition Department) asked how stable over time the structural features of languages are – aspects like word order, the inventory of sounds, or plural marking of nouns. "If at least some of them are relatively stable over long time periods, they promise a way to get at ancient language relationships," the researchers state in their paper. "But opinion has been divided, some researchers holding that universally there is a hierarchy of stability for such features, others claiming that individual language families show their own idiosyncrasies in what features are stable and which not." Using a large database and many alternative methods Dediu and Levinson show that both positions are right: there are universal tendencies for some features to be more stable than others, but individual language families have their own distinctive profile. These distinctive profiles can then be used to probe ancient relations between what are today independent language families. "Using this technique we find for instance probable connections between the languages of the Americas and those of NE Eurasia, presumably dating back to the peopling of the Americas 12,000 years or more ago," Levinson explains. "We also find likely connections between most of the Eurasian language families, presumably pre-dating the split off of Indo-European around 9000 years ago." This work thus has implications for our understanding of differential rates of language change, and by identifying distinctive patterns of change it provides a new window into very old historical processes that have shaped the linguistic map of the world. 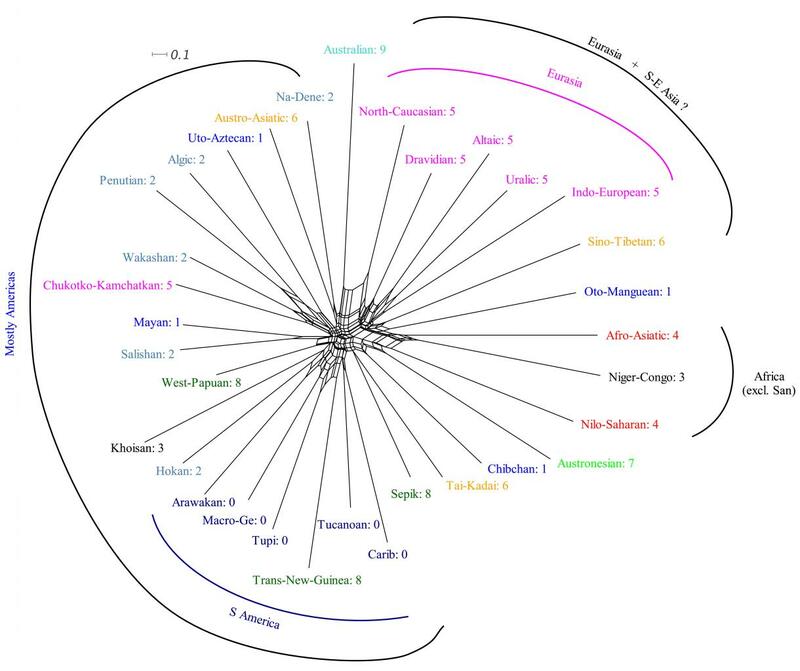 It shows that there is no conflict between the existence of universal tendencies and factors specific to a language family or geographic area. It also makes the strong point that information about deep relationships between languages is contained in abstract, higher-level properties derived from large sets of structural features as opposed to just a few highly stable aspects of language. In addition, this work introduces innovative quantitative techniques for finding and testing the statistical reliability of both universal tendencies and distinctive language-family profiles. "Our findings strongly support the existence of a universal tendency across language families for some specific structural features to be intrinsically stable across language families and geographic regions," Dediu concludes.